Our society places a premium on being able to do everything you to get done with your own two hands. The world of drywall installation, for example, is full of DIY craftsman looking to save money by taking on the task alone. While this is admirable, it is important to note that installing drywall can become quite complex, even for the more handy citizens. Hiring a quality residential or commercial drywall company can provide a wide range of benefits to homeowners and entrepreneurs alike. AZ Drywall Finishing aims to be the best drywall contractors in Chicago with a keen focus on delivering amazing quality and service. 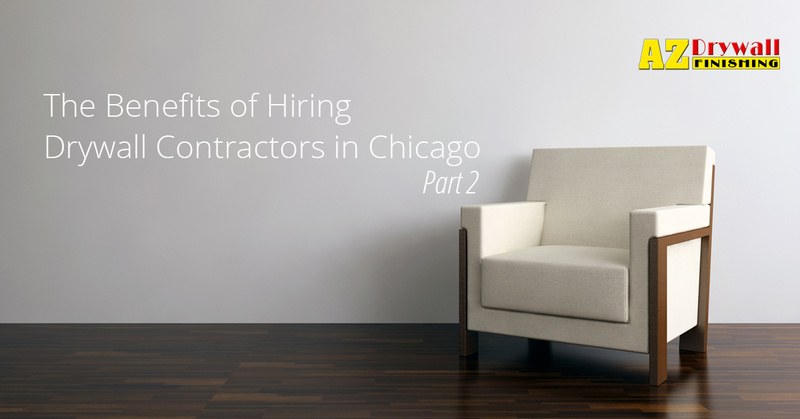 In our last blog, we discussed a few benefits of hiring a professional drywall company. Today, we’ll continue this endeavor by explaining how our drywall services keep everyone safe and offer you the ultimate in convenience. While many companies take on the “safety first” slogan, it seems as if injuries and property damages are a common occurrence. AZ Drywall Finishing strives to make this our top priority for any project! From regular OSHA training sessions to keep employees current on safe practices to triple-checking our lifts and scaffolding, we maximize our safety regardless of the job’s size. Strict guidelines ensure that your home or business is taken care of in a safe, secure manner. DIYers may have the skills needed for installing drywall, yet they may not have the proper equipment to complete the task in a safe manner. Our professional team will arrive onsite with all of the gear needed to get the job done effectively, including the correct personal protective equipment (PPE). From glasses and masks to fall arrest harnesses, each and every hazardous risk has been considered and taken care of. Drywall dust and small amounts of silica can also become a hazard when inhaled. Even if an ametuer drywall finisher completes the project with precision quality, their lung health may be jeopardized, as it is essential to protect against the inhalation of contaminants. Our top-notch team will take the best measures to ensure that they are protected as well as the air in your home or business. We know that the satisfaction of performing a clean cut and creating a quality surface is hard to beat. However, many residents do not realize the full depth of effort needed for their drywall installation adventures. The process of purchasing the correct tools and materials, transporting them to the project site, measuring, cutting, installing, taping, sanding, and texturing all add up to create a sizable task. Amateur experts may like the thought of doing it themselves while being very discouraged by the process. Our team will come and take care of everything as quickly and efficiently as possible, letting you focus on other important tasks. The art of drywall installation lies in the fact that no two jobs are the same. As such, our drywall contractors have served the Chicago area since 1999, focusing on delivering the best quality and satisfaction to our happy customers. Working with AZ Drywall Finishing means you are partnering with a top-notch commercial and industrial drywall company that puts the customer’s needs first. We also provide other services, from fiberglass insulation to acoustic ceiling installations. Contact us today for a free quote on your upcoming project!